I think possibly my favourite thing about eating seasonally, is the way that, when you haven't eaten a particular food for 11 months, it tastes absolutely amazing. 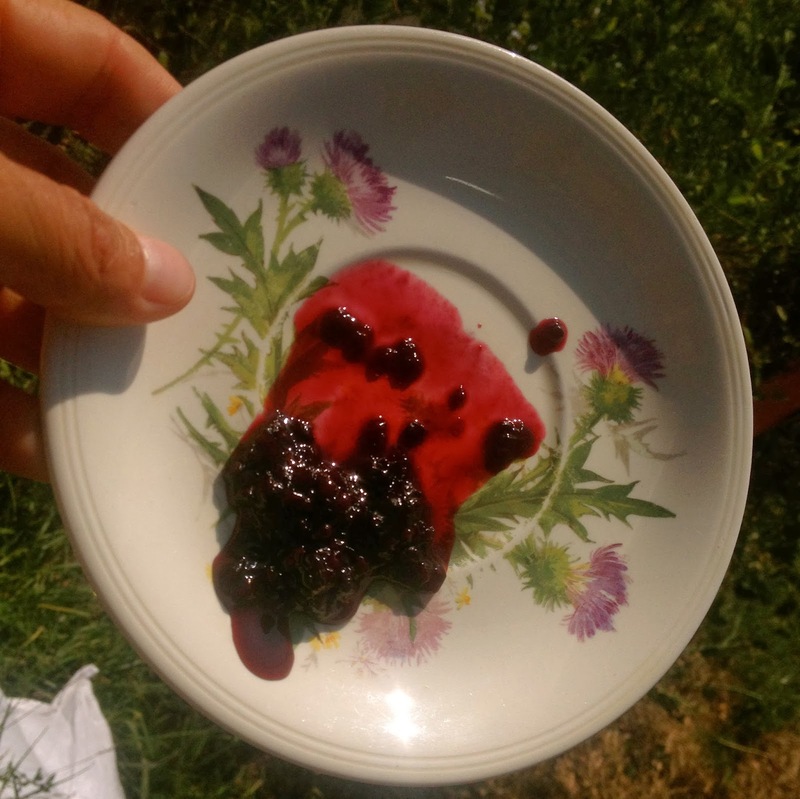 About a month ago, when we had our first taste of blackberries for this season, we were exclaiming over their deliciousness, trying to decide if it was because they actually were particularly delicious this year, or if it was just because we hadn't eaten any for so long. I'm pretty sure it's the latter. For the last month or so we've been picking (and eating!) to our hearts' content. This suits me - I'm absolutely a summer fruits devotee - stone fruits and berries all the way. So an almost daily pilgrimage to our beautiful blackberry glen has been absolutely fine by me. And fine by the kids too (OK - not fine when they get a leech, which happens...), who have amazing adventures involving cubbies in the blackberry brambles and wild and exciting tree-climbing fantasies involving their trusty 'hunting dog', Bell. We've been stockpiling them in our freezer, til we had enough to make all the things we have planned - wine, jam, and blackberries in syrup - all the while munching away and enjoying them in all kinds of scrumptious things like baked yoghurt custard and blackberry pancakes. The trick, we've found, with the blackberry pancake, is to drop the berries on before you flip them over. Of course, the purple pancake that results from mixing the berries into the batter is a beauty all of it's own, but this way's pretty gorgeous too. 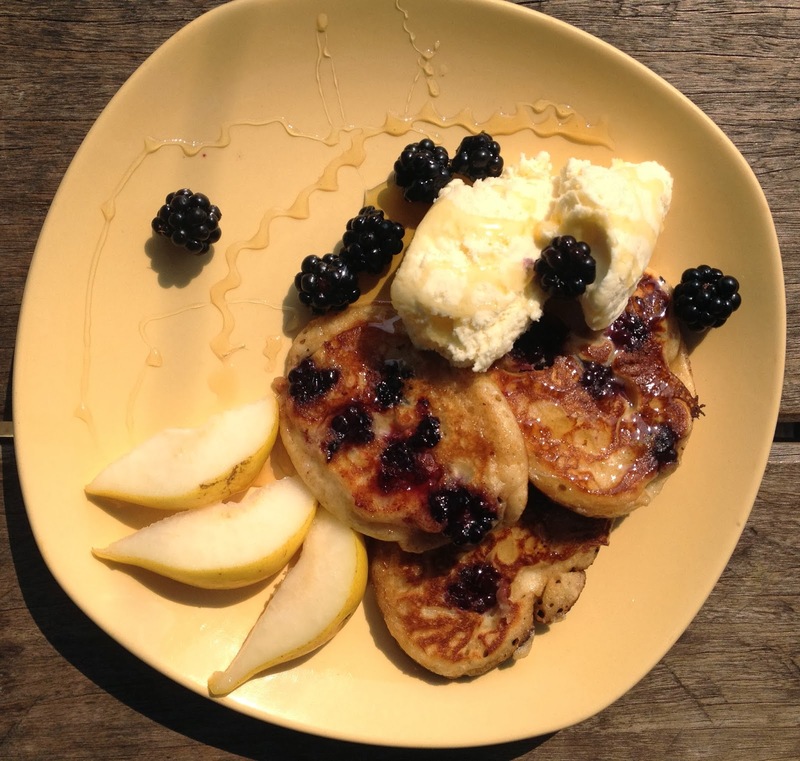 Blackberry pancakes with fresh ricotta, local honey and pear, eaten in the sunshiny sunshine. Today Pearl started the blackberry wine (not ready for 3-4 months), which I'm very excited about, and last night we stacked our precious jars of jam and blackberries in syrup up on the shelves, feeling happy at the prospects of some sweet sweet summertime goodness to take us through the winter months. It's a pretty great feeling. 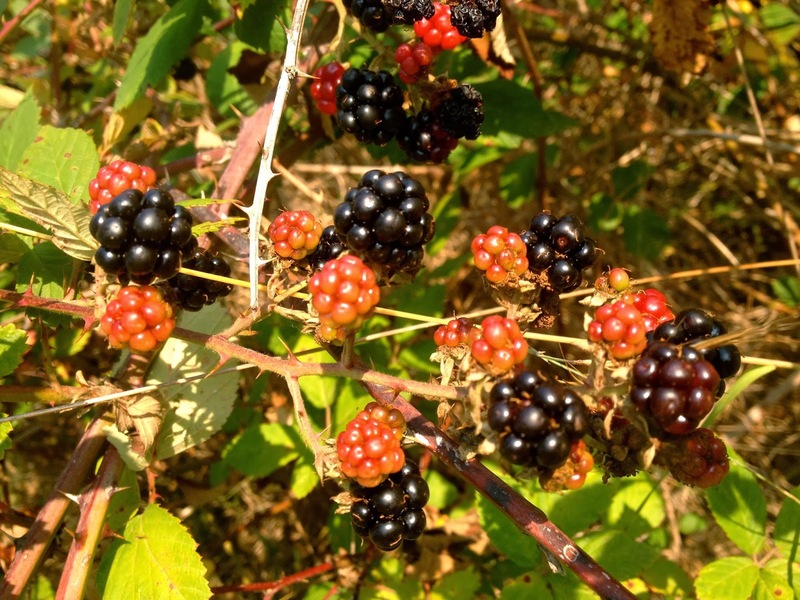 And while our days of eating fresh, sun-warmed blackberries fresh from the bush are very nearly over, we have the knowledge that when we taste them next, in 11 months time, we won't be able to decide if they're extra delicious, or if we just missed them. Who knew that a kelpie's favourite food in the world would be blackberries?? About a week ago, our preparations for the Bega Show began. We'd gotten the show schedules a few weeks ago, and spent hours poring over them, circling the categories we thought we'd enter: Crochet, patchwork, papier mache, dinosaur garden, flower arrangement in an egg cup, preserving of all varieties, beer, wine, yoghurt, eggs, decorated arrowroots, photography, drawing, a useful item made from baling twine (yes - it's a real category) and, of course, junior soft feather bantam. We'd resolved that we'd enter in order to contribute to the beautiful display in the pavilion, and that it wasn't about winning... But that didn't stop me from jumping up and down when I saw that my rhubarb and raspberry champagne had won champion wine of the show!!!! Wooohooooo!!! I got a ribbon!!!! If it hadn't been locked in the cabinet in the pavilion, I would have worn it like a sash as I walked around the show. It's true we did have some successes - Pearl got a first for her preserved (home-grown!) globe artichokes, second for her plum jam and yoghurt. 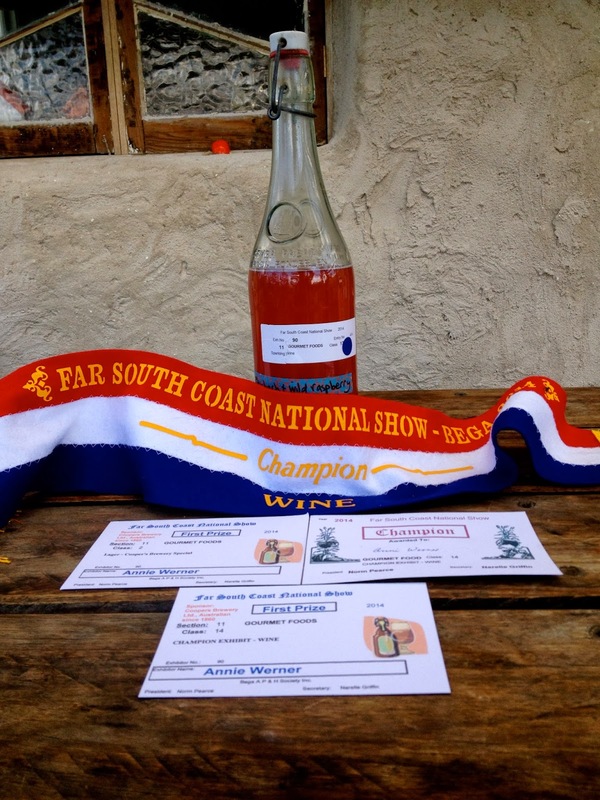 I got first for my lager, baling-twine shopping bag, and champagne, and second for my crocheted stubby holder (yesssssss!). Olive's 'baby' Errol, got second in the junior soft feather bantam category, and Olive's papier mache and photography also got some second prizes. Olive and Errol in the poultry pavilion. In the words of the judge: "Yeeaaah... He's a good lookin' chook this one". What more is there to say? Not that it was all winning - we did have some entries that didn't get a mention, but it was really great to see them all there in the display. It's really exciting to walk the pavilion and look at the entries, and check out which friends have won in different categories. 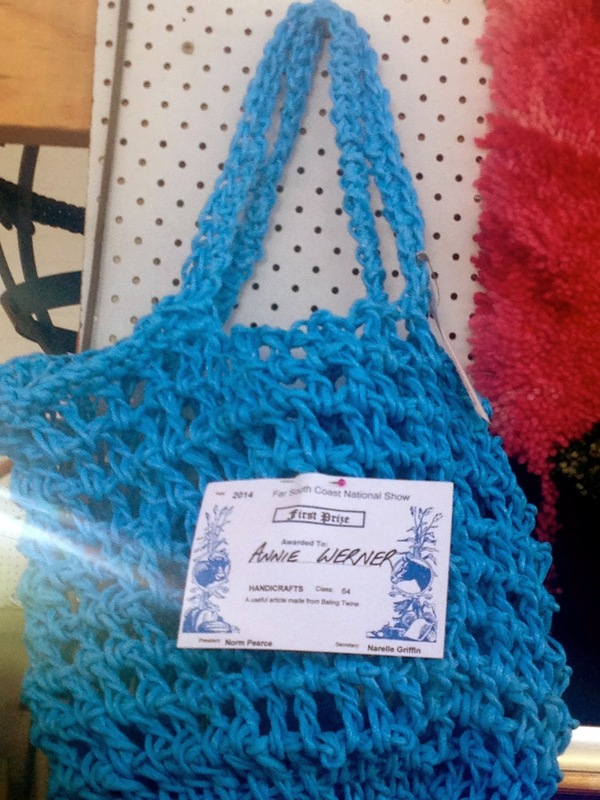 While it does make an unusual, fetching, sturdy and award-winning shopping bag, crocheting baling twine is not an easy project. 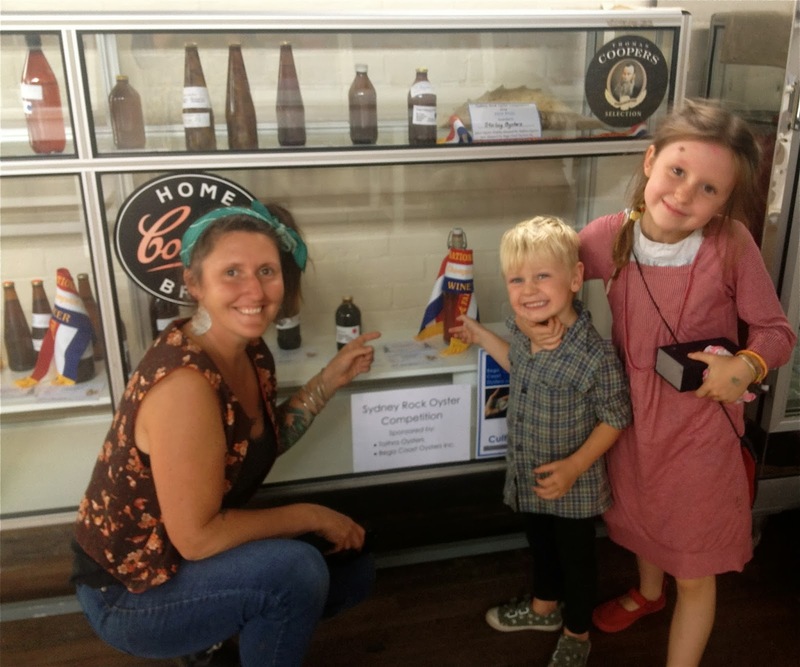 The kids got a real kick out of seeing their entries, and didn't seem bothered at all when they didn't win anything. They were just excited to be on display, for all the community to see. And one of my favourite things about the show is that it really is pretty much all of the community who get involved. The old farming families, the newbies, like us, the kids from all walks of life all get out and about on show weekend, checking it all out. But even more than seeing our entries, we all just loved being at the show, meeting up with friends and generally hanging out. The kids made their own fun, running off in a pack and sliding down a grass bank on pieces of cardboard for (literally) hours on end, while we all waited for the grand finale - the smash up derby. We ate (thanks Vickie!) and drank and chatted and laughed and people-watched. It felt like half of Bega was there that night - all the different worlds of Bega, coming together for a very unlikely spectacle. We felt very happy to be a part of it, ribbons or no ribbons. The kids were super-serious about decorating their arrowroots, and even more serious about eating them after the show. Almost exactly a year ago, our dear friends Morag, Louisa, and Huon came to visit. On a whim, we made a garden bed and sowed sunflowers and red mustard, just because we had the seeds hanging around. 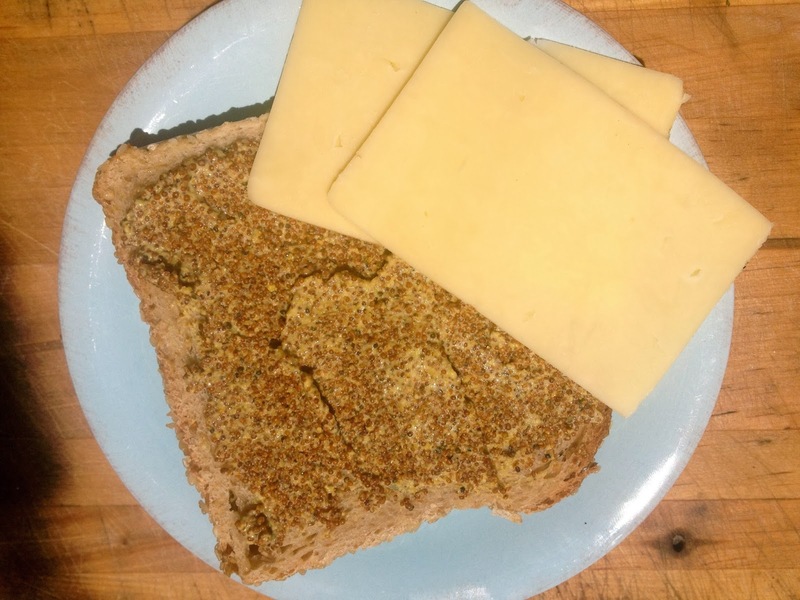 Almost a year later, we cracked open a jar of the mustard we made from the seeds we saved from the mustard we grew. It was a massive, epic effort, all for just 2 jars of mustard, but it was super-fun, kind of novel, and freakin' delicious, in the way that only home grown things (involving a lot of love, sweat and dirt) can be. If you'd also like to undertake a mustard-growing-and-making adventure, just for the fun of it, here's what we did. First, we made a big delicious breakfast which we ate with our dear friends, then set to work digging out and making a little garden bed. We probably (though I can't really remember) dug in some manure and/or compost, then sowed the whole area pretty thickly with a packet of mustard seeds and a couple of handfuls of sunflower seed. When it all came up, we enjoyed the sunflowers, ate the mustard leaves, and sold the excess to our local co-op. Mustard leaves, if you've never had them, are a little spicy and when they're big, a little tough, so if you want them raw in a salad, pick them tiny. When they're bigger, they're delicious sauteed with some silverbeet, or finely chopped and stirred through a barley pumpkin risotto. YUM!!! They're super-easy to grow and pretty hardy, and very very giving for months and months, even if you don't want the hooha of saving the seeds, so they're well worth growing. They also self-seed really well, so you'll have a pretty constant supply once you get them going in your garden. Once the mustards started flowering, we ate less of the leaves, because they got a bit tough, but enjoyed the flowers (the bees did too!) and the amazing colour of the foliage. Mustard seeds like rocket, so we waited for the little pods of seeds to get big and start to dry off, then we picked them all, hung them up to dry some more, then stuffed them into some leftover feed bags (101 uses, I tell you...). We then jumped around on the bags to break open the pods and let all the tiny seeds out. Then, once you have your seeds (you'll be amazed by how few there are...) it's time to make some mustard!! I used the recipe in The Gourmet Farmer Deli Book (bit of a fave 'round these parts), which is super simple: soak your precious mustard seeds in white wine vinegar overnight, puree half the soaked seeds, then mix the puree, the whole seeds and some salt and the juice of a lemon. Seal in sterilised jars and keep in a cool dark spot for a month. It. Is. Delicious. Even if it was a ridiculous amount of work for 2 jars of mustard. It was all fun, and ultimately super-yummy, so who cares, right? It's amazing how when you really love someone, you love their baby, even before you've met them. You may remember a while back I made a couple of preggo skirts for my dear friend Niki. Well, she has since hatched her baby - a little Lucien - and though I haven't met him yet, I am besotted. I was lucky enough to see Niki for a flying visit just a couple of days before she gave birth. It was beautiful seeing her and her partner, but I was secretly hoping the whole time that she'd go into labour and have a really quick birth so I'd get to meet her bubba before I had to go home. It didn't quite happen like that, but it sure was lovely having a visit, and it was also great to be able to personally deliver the quilt I'd made for little Lucien. The baby-quilt-that-doubles-as-a-playmat has become something of a tradition for the very nearest and dearest of babies in my life. I love love love the process of selecting the fabrics and laying them out, incorporating all kinds of bits and bobs to entertain the little bubba (flags, ribbons, tags and the like), and also reflecting a little of what I know of the baby's parents, and what I hope for the baby themselves. And then, of course, I spend hours and hours sewing the whole thing up, imbuing every stitch with a whole lotta love for parents and babies alike. In the case of the quilt I made for our friends Ally and Rich's baby, Annie, it was a whole lot of biodiversity and veggies that made the cut, being as they are permies extraordinaire. For little Mr Lucien, I wanted to incorporate lots of bits of us because I know that, in spite of the love I feel for the little fella and his outstanding mumma, I'm not going to be as present in his life as I'd like, given the tyranny of distance. So I used bits of our clothes. Bits of favourite Olive and Oscar clothes, scraps of fabric from tops and skirts made for Pearl and I, and the back of the quilt is made from a patchwork of flannos - ex shirts and PJ pants for that one-of-a-kind pre-loved snuggliness. Lucien, I hope your quilt keeps you warm little fella. Can't wait to give you a cuddle x. A few months back, my fellow chicken grower/abattoir worker and general farming mentor Mandy said to me "Farming's really all about loss". This seemed like a dire assessment at the time, but I figured she'd know - she and her lovely family run Symphony Farm, which is an amazing, integrated, certified organic property in Tilba. She's been farming her whole life, as has her husband and all their (now grown up) kids. The last week, we've learned first hand a little bit about what she meant. It's not so much that farming is all about loss - see our last blog post, for an example of the joys - more that your farming life is kind of defined and ruled by loss and the avoidance of it. A week and a half ago, our then-week-old chicks started dying. They basically haven't stopped. After talking to experienced chicken farmers and hearing the findings of my mum's thorough research, we thought we'd narrowed down the cause of the fatalities to the new rawbale brooder house. Turns out there is a condition affecting young chicks that can be caused by spores that grow in strawbales. We decided this was our problem, so dismantled the brooder house (a humbling experience) and hurriedly built a new brooder out of corrugated iron. The deaths slowed, but still haven't stopped, despite the 2-6 day incubation period having passed. We've also had days and days of hot weather, which gives us the challenge of keeping the chicks within a safe temperature range - lots of wet towels and water dishes around the place is pretty much the best we can do. We know some other people who got chicks from the same batch from the hatchery, and they are also having problems. It's not so much that there is a single lot of symptoms affecting all the sick chicks, more just that the chicks seem to be very weak, not resilient, and lacking an appetite. It's upsetting, to be sure, and frustrating because we have no idea how to help the situation and make it stop. All we can do is take extra care (we've set up a little hospital inside our house for the ailing chicks, and have had some success with recoveries) and make sure the chicks are comfortable and eating well - kale, kelp meal, brewers yeast, and apple cider vinegar are all on the menu in addition to their normal rations. In this midst of all this, we had another, more devastating decline in one of our animals. 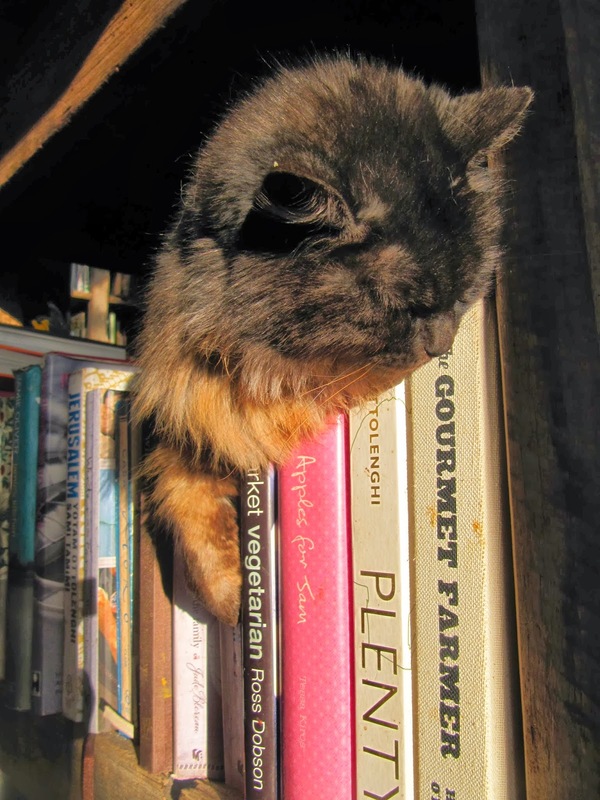 My beloved cat, Bunn, who has been my cat companion for my whole adult life, went from sleeping a lot (kind of OK given she's an old lady), to not being able to walk, to barely breathing in the space of about 24 hours. After sitting up with her all night, patting her and crying, I made the agonising decision to have her euthanased. We are all very sad. 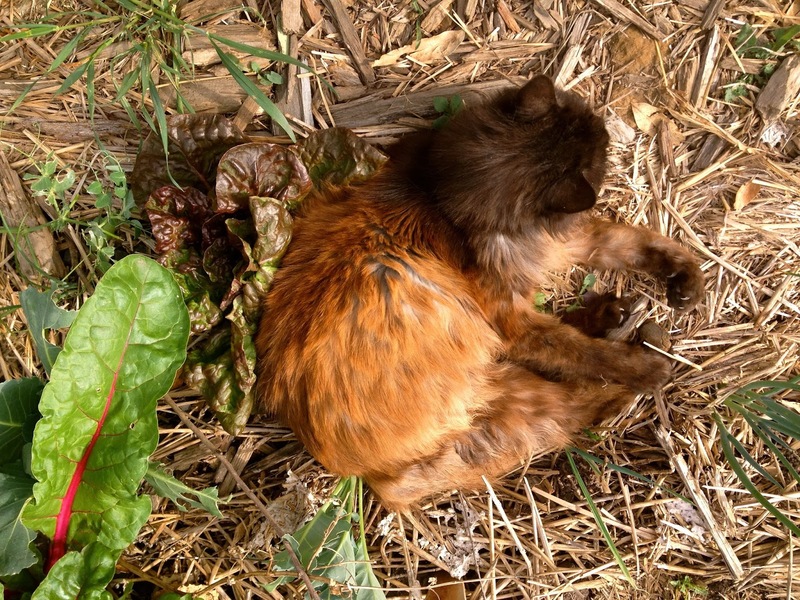 She's been such a constant in our lives, from inner-city alley cat, moving through all my many and varied share houses in the Inner West of Sydney, to born-again farm cat traipsing through the paddocks and enjoying the strawbale windowsills at Autumn Farm. I'm glad that this is her final resting place. She will be missed. Bunn's last photo - helping the kids with their camp fire, where they were busy cooking a "buffalo leg"
The night we buried Bunn, our dog Sock - Mr A1 Fox Chaser here at Autumn Farm - was helping me with the chicken rounds when he ran out onto the road and was hit by a car. He broke his tail, and also his pelvis in 3 places. 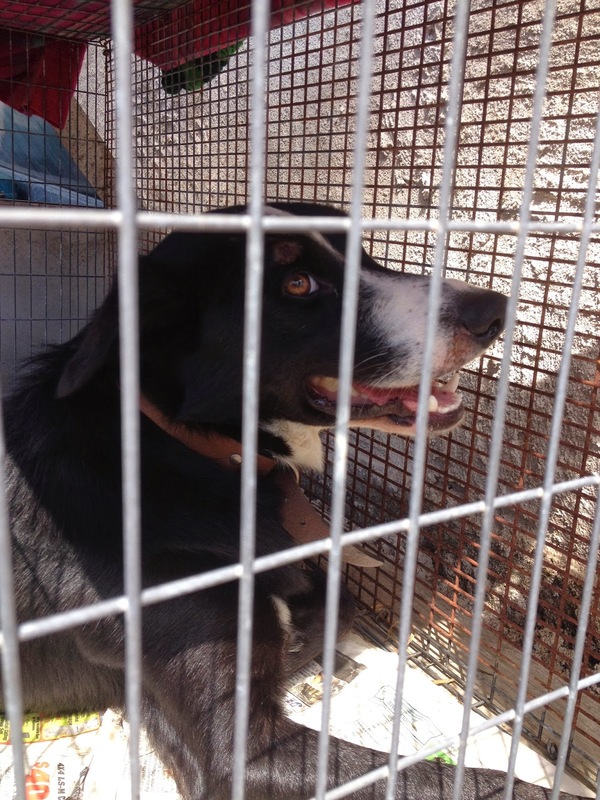 Euthanasia was also on the cards for him, until the vet reconsidered his age. She said she's seen good recoveries from breaks much worse than his, given 12 weeks of cage rest. So more nursing our very sore and sorry pup, who is to be confined in his cage for the next few months dining on vegetable and chicken broth, and chicken hearts and livers. It's been a sobering, humbling experience for us. We are still so grateful for everything we have, and we know how minor our losses are in the scheme of what some people experience in their lives and on their farms. And we do have some beautiful things to be grateful for in spite of the sadness. 8 baby ducklings, abandoned by their mother the day they hatched are now living with us (in our tiny house during the night, and in our veggie garden during the day) after being brought back from near-death with the help of a hot water bottle. They're cute little things, and a timely reminder that the vagaries of life on a farm aren't all bad, and that life and death are just all part of the grand scheme.